We tend to think of photojournalism in terms of that which fills the pages of our newspapers, but speaking to Russ Barnes it seems like a good description of his approach to image making. He says that he often goes out looking for a story and in search of the character of that which he sees. Much of his photography is local to his home at an interface between town and country. When he travels it tends to be relatively short distances, from the compact countryside of South Warwickshire to the more open rolling landscapes of the Cotswolds. Trees are prominent, the sky often absent or playing a supporting role in a reflection – these are largely peaceful images elevated by Russ’ careful use of light. Tell us a little about your background (education, childhood passions, early exposure to photography and vocation) and how this has influenced your photography? I lived out my childhood through the 1970s and of course life was a lot simpler back then. My early pursuits mirrored the time and definitely involved a lot of art. The skills my father possessed unquestionably influenced this – he was an engineer by trade but was also a very skilled watercolour artist, he could draw absolutely anything and he was inevitably a great photographer too. He seemed to be able to see and translate anything to paper, a truly rare ability these days. Unfortunately he died suddenly in the 1980s but I still have some of his paintings on my walls, a favourite of mine is some Canadian Birch Trees he painted before I was born and still provides all the reminder I need of my love of the landscape. Photographically speaking, some of my earliest memories are hours spent with my father’s wonderful Rolleiflex. I was absolutely fascinated by the image in the massive (well it seemed massive back then!) top down viewfinder which I loved. Photographically speaking, some of my earliest memories are hours spent with my father’s wonderful Rolleiflex. I was absolutely fascinated by the image in the massive top down viewfinder which I loved. We didn’t even have colour TV so seeing images like this through a lens totally captured my imagination. My favourite uncle also owned his own photography business and cameras were everywhere. I still have a couple of old film bodies he gave me though I think I’m right in saying that I’ve never even checked to see if they actually work. Nice tokens of my childhood all the same. At school, under my father’s additional guidance, I developed an aptitude for art. I learned all the basics I needed in my early years in terms of composition, light, perspective, vanishing points and so on, all lessons which I take completely for granted within my photography today. I was definitely interested in film photography at school but like early home computers it all seemed to totally intimidate me somehow. I was never interested in the technical part of any process, only the end result and if I couldn’t get there relatively quickly I lost interest. I think this is why I dropped art after A Level because mediums like drawing had to be a labour of love, took time and effort and I remember being very frustrated with my level of skill and the end result taking far too long. Fast forward a decade or so and the digital photography revolution was developing fast. I picked up my first digital camera when I was about 30 and haven’t put one down since – that is already 15 years ago now. Finally I had a mechanism and tool which produced almost instant results. 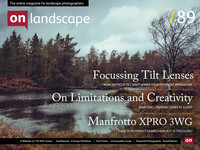 if you read many of the photography magazine titles out there today they will talk a lot about the need for infinite depth of field, tiny apertures and endless sharpness. It’s all very one dimensional, pretty boring and I fell into that trap for long enough. My father provided a portal into the art world. Again, with no internet and limited TV while I was growing up, we had art books everywhere instead. My father studied the classics and I love them today as much as I did back then – John Constable, Claude Monet and William Turner featured heavily in my youth and seeing their work in galleries is still very exciting for me today. Interestingly, the trigger for my love of landscape wasn’t actually driven by an artist; it was from the one and only Sir David Attenborough, who I hold up as the first and last word on the environment and life on earth. He opened up the world for me; when Attenborough spoke, I sat up and listened and I just knew I had to get out there and do something photographically with the environment around me in mind. I spent a few years shooting wildlife, driven by Attenborough’s infectious passion for the planet, but my attention in the end turned towards the land and the rest is now history. Have you had any moments where things became clear, or new directions were formed? How did they change your photography? There have been one or two moments of note in my photographic development, not necessarily immediately obvious at the time. Early on as I developed my interest I definitely observed too keenly other people’s views on what made a ‘good’ landscape photograph. Indeed if you read many of the photography magazine titles out there today they will talk a lot about the need for infinite depth of field, tiny apertures and endless sharpness. It’s all very one dimensional, pretty boring and I fell into that trap for long enough.I was soon searching for something very different, something more artistic and meaningful than that. “What if I crop the sky completely out of the frame here?” And so on. The questions might still require some imagination but I find “what if” is the only companion I really need these days. You say that you try not to be too conventional? Well I did say try. Yes, there are times when I want to depict the scene in front of me using a more conservative approach but often I’m interested in creating something a little different, something a bit more artistic and occasionally ethereal, with purpose, perhaps a touch of magic with the available light, but ultimately where the subject is clear. I don’t do much ‘big vista’ type shooting with massive skies these days – I find that sort of photography often lacks a point of interest, has competing subject matter in the frame and adds up to an “oooooh look how pretty all of this is” approach… we used to call that “chocolate box” photography at school. I’m not sure that more traditional approach to landscape is really in my DNA but it’s up to everyone else if that’s visible or not. I shoot a lot with telephoto lenses and enjoy closing down my subject, I use narrow depth of field a lot and creative blur too, I love my infrared option or anything which will make the viewer hold their attention for more than a few seconds. I’m not sure all of this entirely makes me unconventional but I work quite hard on trying to carve out something of my own view of the world instead of trying to replicate how many other people see things. When I go out, I don’t just rush around woodland collecting images when I shoot, I will often stand on my own and just listen to the silence and take it all in. What is, for you, the appeal of landscape photography? You mention “connection with the land” quite a bit. I lead a busy life, I have a full time job and I feel the working week is like a whirlwind, and actually I really hate that feeling. Grounding myself with the planet and reconnecting with the environment is very important to me when I can. When I go out, I don’t just rush around woodland collecting images when I shoot, it might sound a bit corny but I really will often stand on my own and just listen to the silence and take it all in. I believe the term ‘mindfulness’ has been coined these days which probably best describes the closest thing to what I’m trying to articulate here. You choose to make images for yourself and to largely stay away from getting involved in workshops or print sales. Do you think others sometimes find this hard to understand? I spent a year as a full time professional landscape photographer. At the end of that year I hated photography and I just wanted to bin it. It had certainly become about everyone else and what they wanted, where the gaps in the market were, what everyone else was doing. Ridiculous. Photography had become a completely commercial pursuit for me, I needed it to work to pay my mortgage and creativity started to become a distant memory. I’m not going back there again and I would urge caution to others considering this path if their sanity and personal artistic development is important to them. I continue to get asked to do workshops and 1-2-1s but it really doesn’t hold my interest right now and I haven’t done one for a long time. It’s also correct that I don’t even offer prints on my website at the moment though in truth I won’t turn down a print request or some ad hoc commercial work because I now have time for it and I consider it to be something of an inevitable consequence of doing what I do and realising a certain standard. Don’t get me wrong here – I think it’s a massive compliment that someone wants to put a photograph I’ve taken on the wall and I will happily fulfil that request with considerable pride and diligence. The key thing is that it isn’t my focus and I can take it or leave it, it no longer matters financially and that’s just the way I like it. Thankfully landscape photography for me has returned to being food for my soul again, commercial needs poisoned that for a while and money got in the way, as it usually does in life. I just want to put something onto the stage for other people to enjoy and perhaps draw inspiration from. Technique is an important part of your process but your images don’t tend to advertise this? Technique can be developed, copied, shared or hidden I guess. I’ve very much enjoyed the what if approach to my photography, it’s a key part of my development and I’ve done that largely with my own scenarios in mind. If I see something different that someone else has created, I would never ask someone how they did it. I do my own research and reading, make my own judgements. That’s part of the fun, the discovery, the journey of self-development. Make mistakes, make some more mistakes but finally create something you’re really happy with and learn a craft along the way. Which cameras and lenses do you typically take on a trip and how do they affect your photography? You talked about seeing them as offering you options from which you can choose – akin to an artist’s palette? It’s definitely true that I love my kit. I’m not ashamed of that, I work in I.T. and I’m around technology all of the time and it interests me. It’s definitely true that I love my kit. I’m not ashamed of that, I work in I.T. and I’m around technology all of the time and it interests me. Despite working within a fully digital workflow, it is important to me that my photography remains a very tactile pursuit so my kit is an obvious and essential part of that. I used to want to carry a lot of heavy f/2.8 full frame lenses around but that can be very physically demanding so I thought I’d try the Fuji system last year to lighten the load for a while. It wasn’t exactly a match made in heaven, it ultimately presented way too many compromises from my point of view and while we divorced after a few months it taught me that losing some of the kit kilos could be liberating. Since then I tend to go out with two or three lenses at most with one body, though I carry spare kit in the car in case of any unforeseen disaster. I sold a couple of my heavyweight lenses in favour of more nimble options, trading in my beloved Nikon 70-200mm f/2.8 VRII for the f/4 version felt painful at the time but is the sort of decision I’ve not regretted since. Just now my main body is a Nikon D800E for its outstanding detail, I have a 720nm converted infrared Nikon D800 when the conditions are right and lately the low-light/high ISO capability of the spectacular and less bulky Nikon Df which has totally taken me by surprise. It’s a line-up which covers all of my needs and possibilities. Many photographers may claim kit isn’t that important but each of those camera bodies provides me with a very different option that no one can really deny, one size most definitely does not fit all. Where lenses are concerned I set a very high bar quality wise and will often carry a combination like my Zeiss 25mm f/2 ZF.2, Nikon 45mm f/2.8 PC-e (Tilt/Shift lens) and the comparatively light but powerful Nikon 70-200mm f/4. Each lens offers me something diverse where perspective, angle of view, reach or capability is in mind and that’s essential. Each lens has a characteristic that’s different to the next, exactly like an artist’s palette as you described. You often choose subdued tones and you mentioned that the colours in ‘Backwater’ are straight from the infrared RAW files? Tell us a little about how important post processing is in realising your vision. The finishing touch does of course matter very much. It’s naïve to believe that no one adjusts their images later, we all know even the great film photographers did that. However, like many landscapers I still try very hard to get it right in-camera as far as possible but I always give myself the best processing opportunities and options later by only shooting in RAW. My Backwater series was born from one of those what if questions, it’s very much a ‘what you see is what you get’ technique straight out of the camera and I love that, it’s refreshing in many ways. Do you print many of your pictures printed and, if so, how? I do have an Epson 3880 which provides beautiful output up to A2 and I enjoy this part of the image creation process very much. I’ve favoured Canson papers which seem to work particularly well but in truth only print about 5% (or less) of my finished images. I wish I had a bit more wall space but conversely I think filling your own home with your own work feels a little narcissistic. I keep telling myself I need to do a solo exhibition but somehow it doesn’t feel like it’s been a particular priority and given I don’t actively advertise print sales on my website, the printer inevitably sits silent and dormant. Instead, I have hung prints from photographers such as Dav Thomas, David Baker and Greg Whitton in my home which remind me to look at things differently and that there continue to be many more possibilities out there. We talked a little about the fact that you don’t tend say or write much about your images, but that titles are important to you and are part of your creative process? Yes, often the right title brings purpose or explanation for me, a small clue on what you’re trying to say to the viewer perhaps, at least that’s how I think. I try to think of a title as I’m shooting something as I find it brings into real focus what I want from a scene or composition. That process doesn’t work all the time, I try to avoid really obvious titles like “trees in mist” but when it does come good it can be very effective. Do you have favourite photographs (of your own)? If so can you choose 2-3 and tell us a little more about them? Picking favourites is incredibly difficult for me but if pushed I think the first I would select would be Emerald Gorge. This one was taken up at Padley Gorge in the Peak District during last autumn and while I’ve taken thousands of images of trees, I just love the rich colour, depth and arrangement to this one also helped by the dazzling light from the left. It may not be particularly ground breaking in its design or subject matter but it represented the epitome of exactly what I was after that day. Another pick will have to be a recent one I bagged in The Cotswolds – I really love Eye Of The Needles, not least because almost everyone thinks it’s a mono image, whereas it is in fact a full colour frame pretty much straight out of the camera. The way the light reflects off the trunks to the left of the scene was the element I was really drawn to here but the whole arrangement feels beautifully natural without tipping that balance towards chaos. My final selection would have to be Drift. It’s one of the few images I was really happy with that I took with the Fuji while I had it. It’s a multiple exposure with simple subject matter but the end result is a nice painterly scene that I really connect with. This one really takes me back to my student art days so it has a bit of a nostalgic feel for me personally, I should probably do a bit more with the technique. If you were told you couldn’t do anything photography related for a week, what would you end up doing (i.e. do you have a hobby other than photography)? I watch a tiny amount of TV so it wouldn’t be that, I’d probably end up scouting for locations by walking across the landscape for miles (would that be allowed?). There’s nothing I like more than the outdoor adventure that landscape photography can bring – it’s got me into a few scrapes too and I don’t let fences get in the way, that’s for sure! You say that you feel you have moved on in the last 18 months. In what way? I got stuck in a rut for a while and lost imagination while I was operating as a full time professional landscape photographer but I think I’ve shaken that off now. I have a set of kit that I’m very happy with, I have a lot of ideas too, but regardless standing still has never been an option for me. I want to keep innovating and improving where I can. I do feel I’m finally producing photographs that I’m actually at peace with and that’s been a long while in the making. Are there any achievements of which you feel particularly proud? I won’t lie; getting some peer recognition through a platform like Landscape Photographer Of The Year is a great feeling. Just knowing judges such as Charlie Waite think what you do meets a certain standard or depicts something that others will want to see is a bit of acknowledgement and validation that has put to rest one or two monkeys that were on my back. It’s the third year running that I’ve been selected for the print exhibition and appeared in the book but this year I received Judges Choice, was Commended and Highly Commended and that was pretty satisfying for my year’s endeavours. I’ve also been asked a fair bit to write for and supply images for magazines and other media, ironically a lot of this has come since I gave it all up in professional measures. I’m also very grateful of course for the approach from On Landscape too - it all means something to me and gives me confidence to push on down the path I’m on. I fell into Infrared Photography a couple of years ago which built up from nothing more than a casual interest and curious cheap eBay filter buy so I feel like anything at all is possible from here. I guess with the ‘what if’ scenario in tow that only I will limit my creativity and options, I certainly can’t complain for a lack of kit inhibiting that in any respect. I’m compelled to vary my environment and scenery and I love travelling around so who knows, but I certainly don’t have an agenda. An unbelievably tricky question given On Landscape have already featured many of favourite landscape photographers such as Dav Thomas, Colin Bell, Chris Friel, Mark Littlejohn, Valda Bailey, John Irvine, Jon Gibbs, David Baker, Doug Chinnery, Lizzie Shepherd, Joe Wright and so on. I don’t think my local buddy from Solihull, Greg Whitton, has been interviewed yet - he has some immense work based on mountain scenery, subject matter that’s particularly hard to find in the Midlands! How about Brighton based Finn Hopson for his evocative South Downs work too, they’ve both provided a lot of inspiration to me. p.s. If you want to see a bit of Russ in action close to home there is a bit of video from Practical Photography that is currently on one of Russ' blog posts.